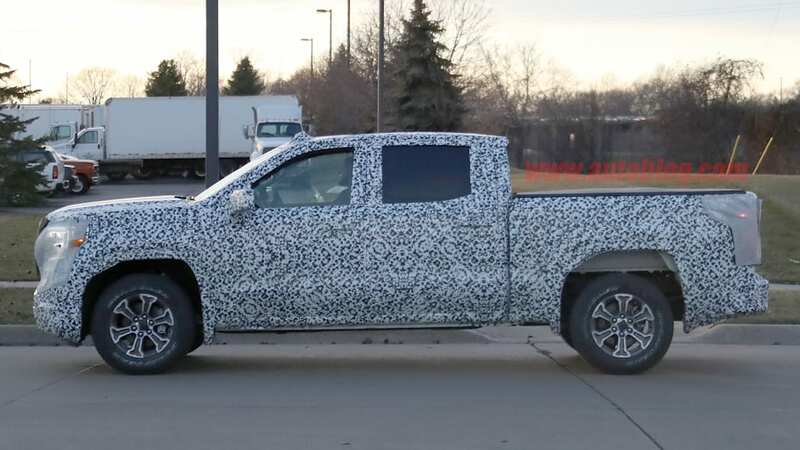 The changes are minor but noteworthy. 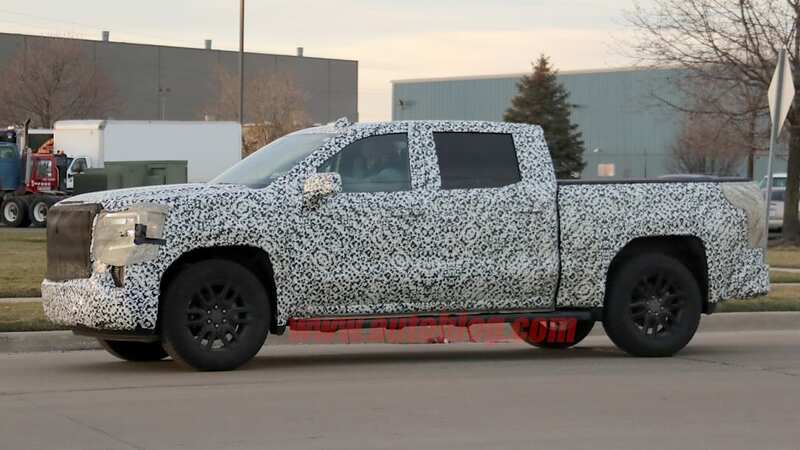 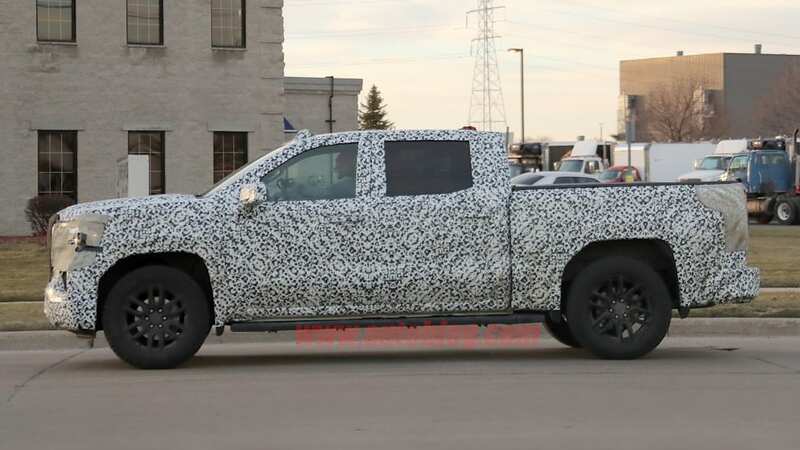 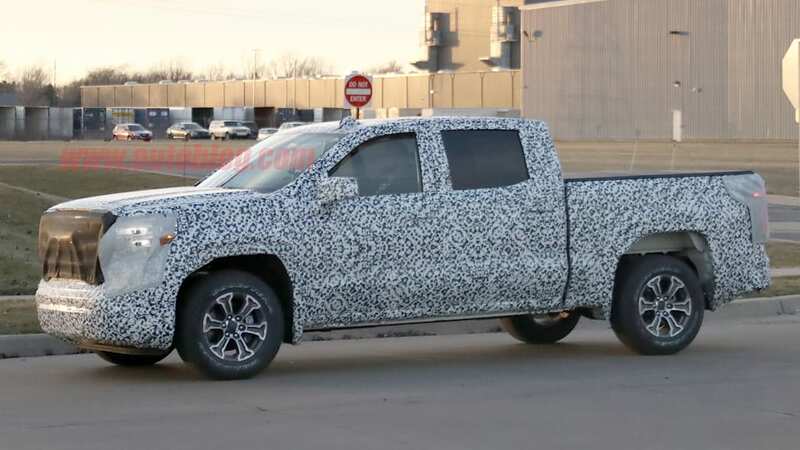 Now that the new Silverado has made its debut, we're awaiting the reveal of its mildly restyled twin, the GMC Sierra 1500. 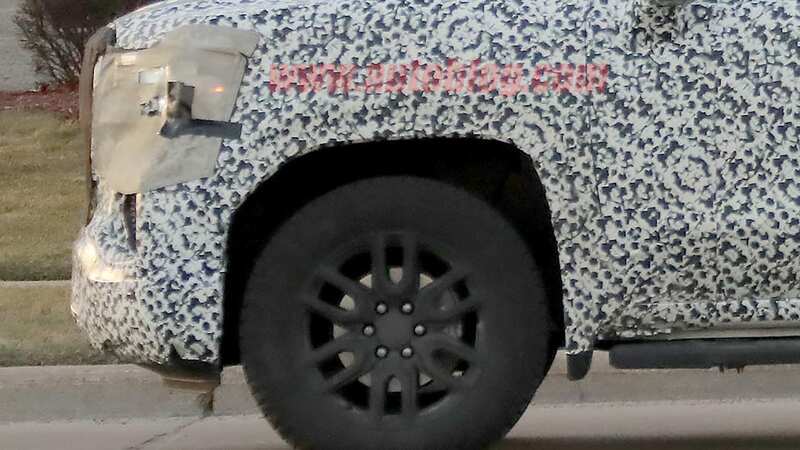 While it likely won't be that different as far as capability and major equipment are concerned, we are looking forward to seeing what design changes it will have. 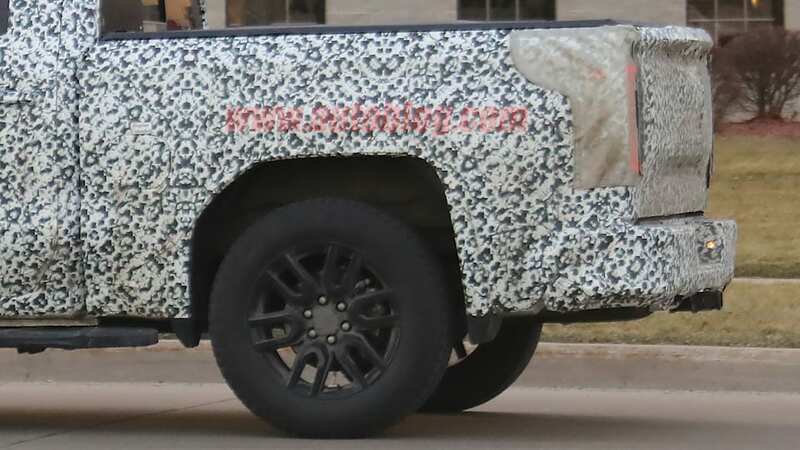 Based on these recent spy shots, the changes will be mild, but still enough to make it visually distinctive. 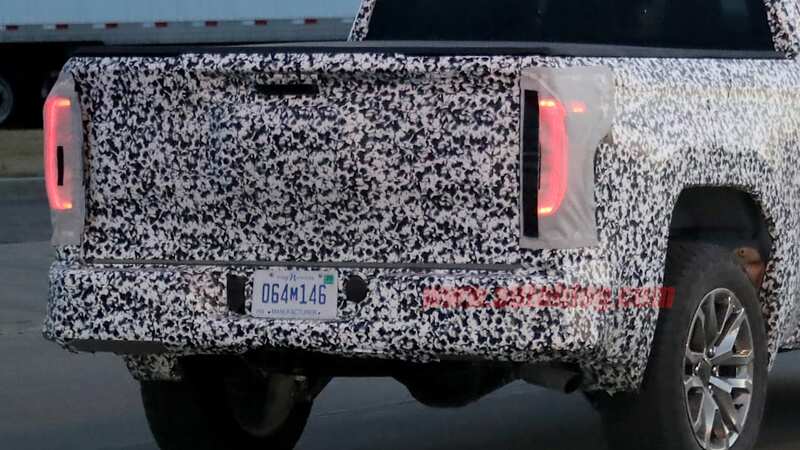 One of the more obvious differences will be in the front fascia treatment. 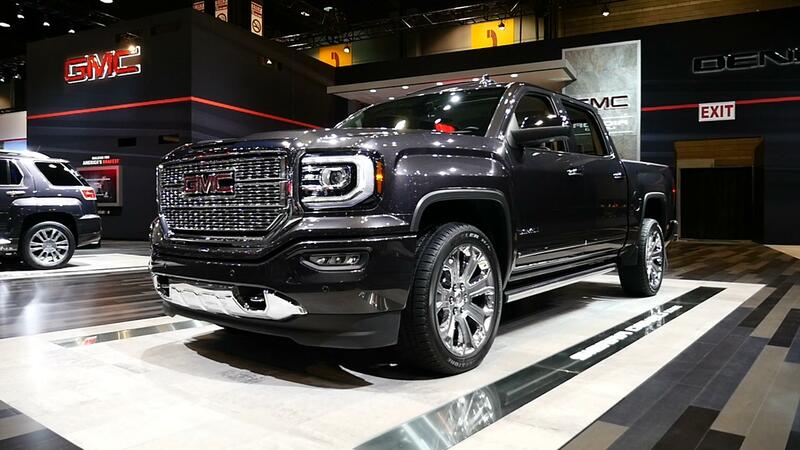 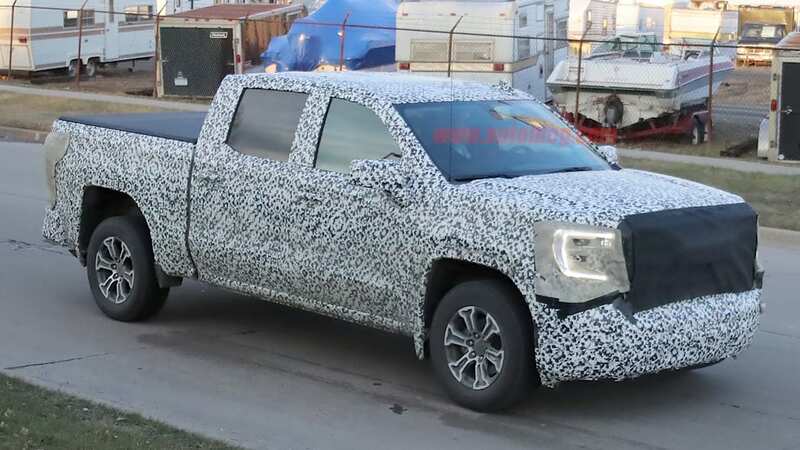 Unlike the Silverado's grille that's level with the top of the headlights, the GMC's will rise above the lights, which will also yield a slight drop on each side of the hood to meet the lights. 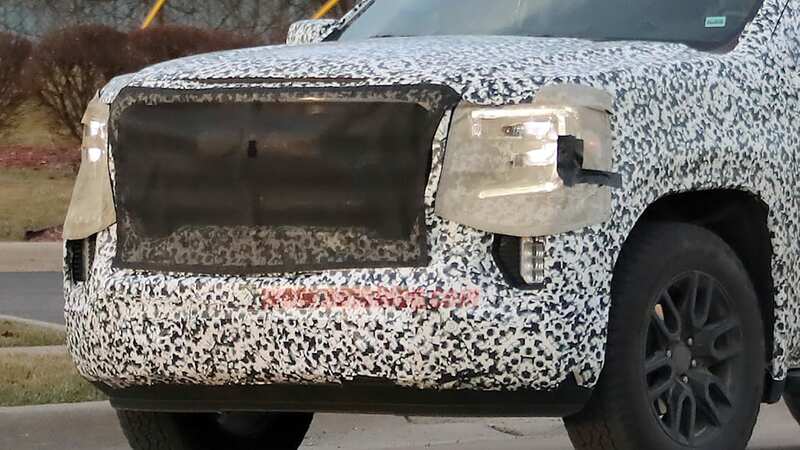 The grille is quite tall, extending far below the headlights, too. 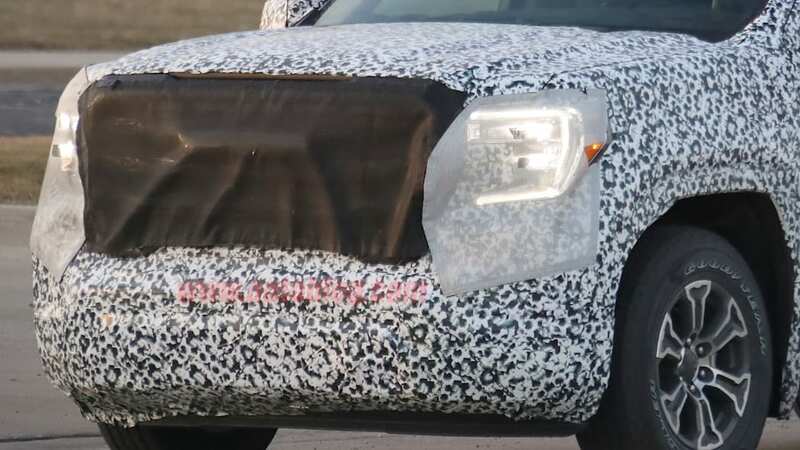 We can make out, behind some mesh, two dips on the outer edges of the grille that give the Sierra a more menacing frown. 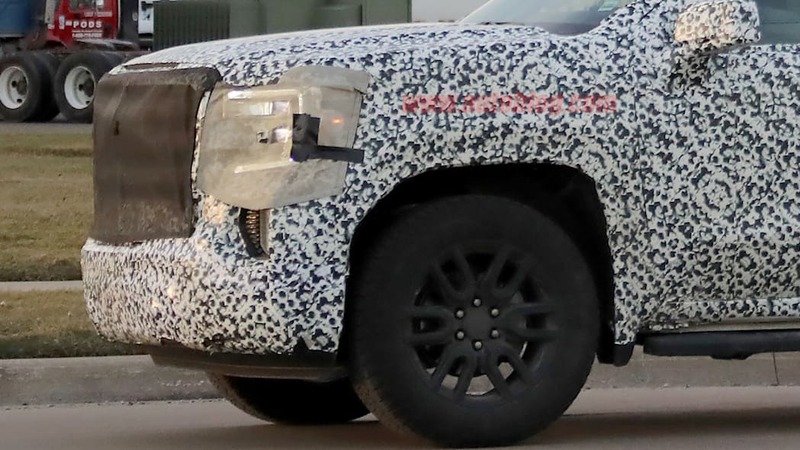 Large foglights are also found right near where the scoops for the wheel air curtains, and the headlights are unified on the edges, rather than split on the Silverado. 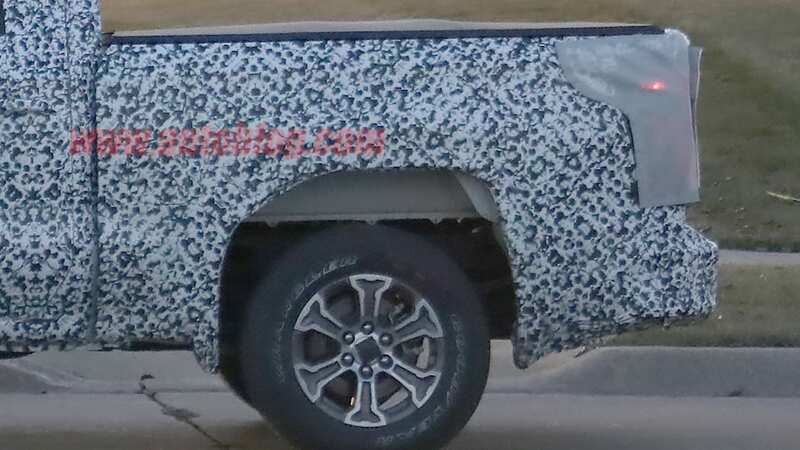 Along the sides, the sheet metal looks relatively unchanged. 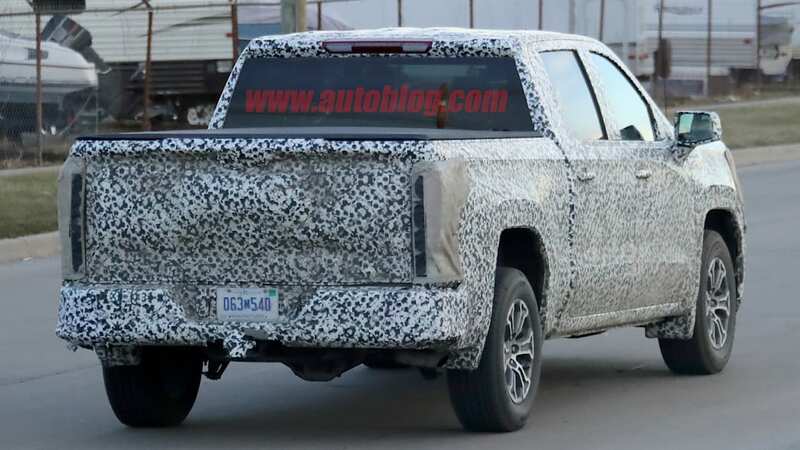 At some angles, we can make out the distinctive shoulder line from the Silverado that runs up to about the rear mirrors where it stops to make room for another crease that rises up from somewhere in the middle of the front doors to lead to the front. 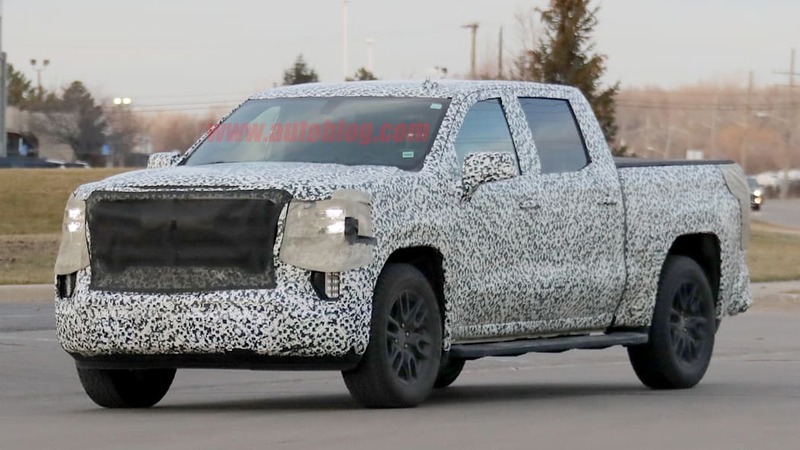 The wheel arches are decidedly different from the Silverado's though. 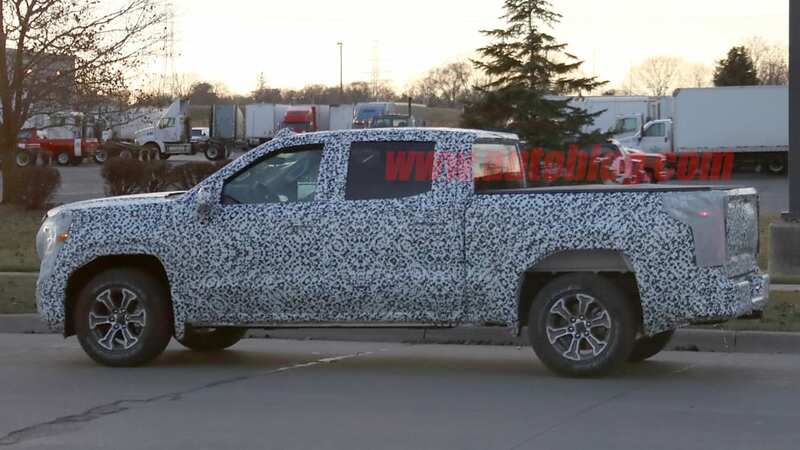 While the Silverado has fairly rounded arches, the Sierra's have a rear-slanted bevel to the fronts of the arches and a rounded 90-degree corner at the rears. 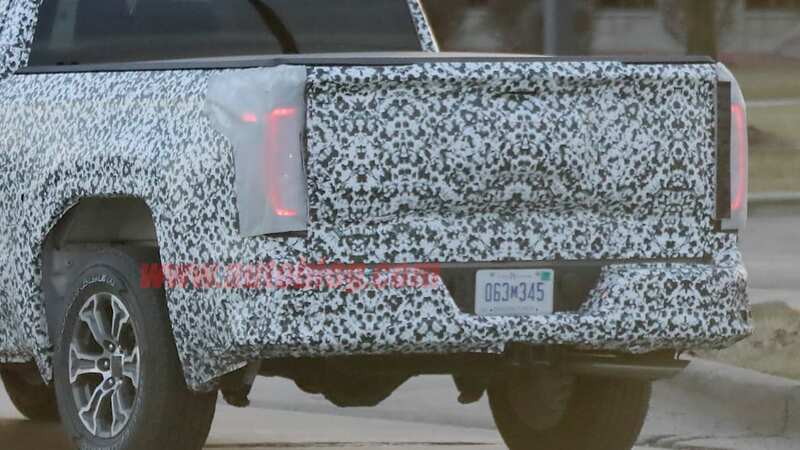 There isn't much we can tell about the rear except for the taillights. 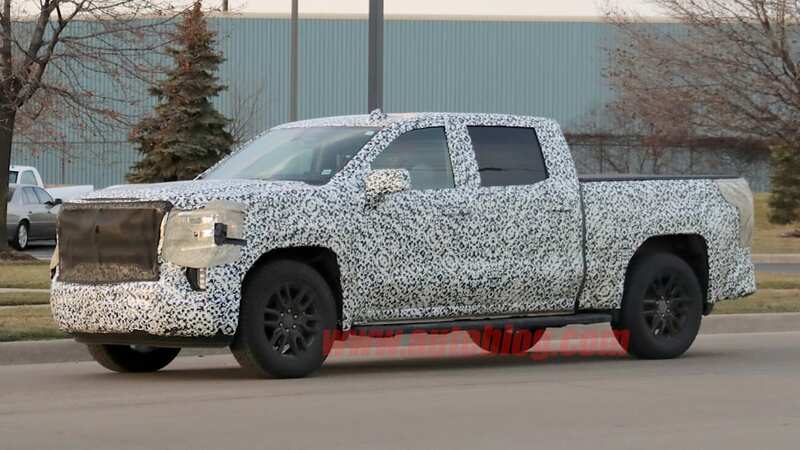 They're quite large, and unlike the Silverado's, there aren't any areas where the sheet metal intrudes. 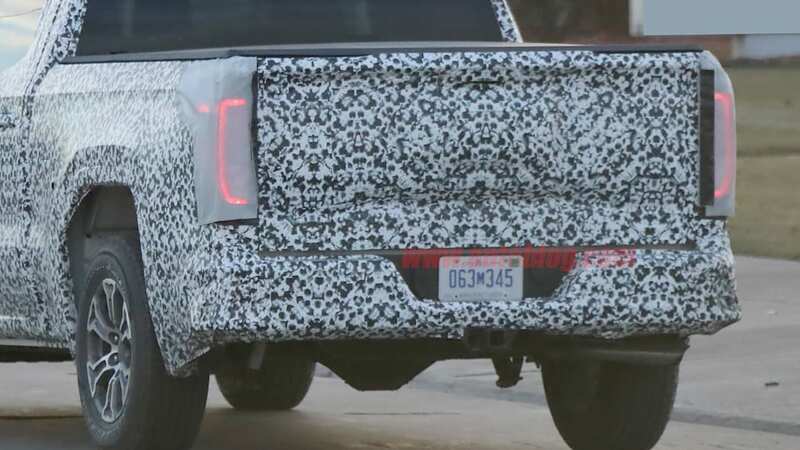 It also appears that the tops of the taillights extend farther forward into the bed sides than the Chevy's. 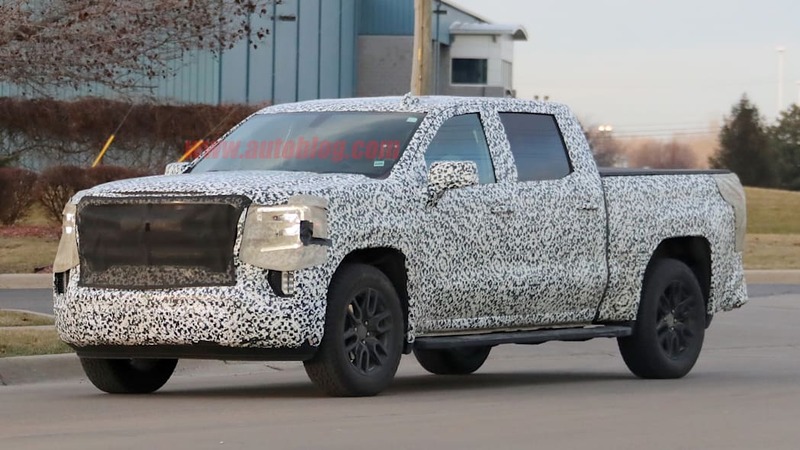 Because the Sierra has almost always been a mechanical twin of the Silverado, we expect it to offer the same 5.3-liter and 6.2-liter V8s, as well as the new 3.0-liter diesel inline-6. 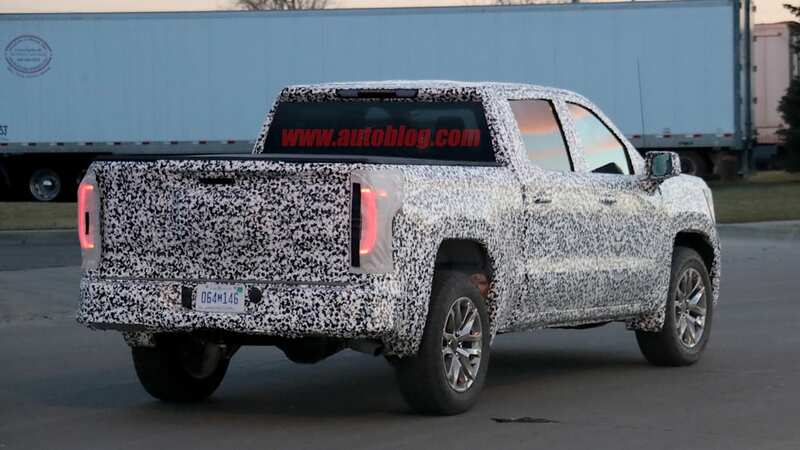 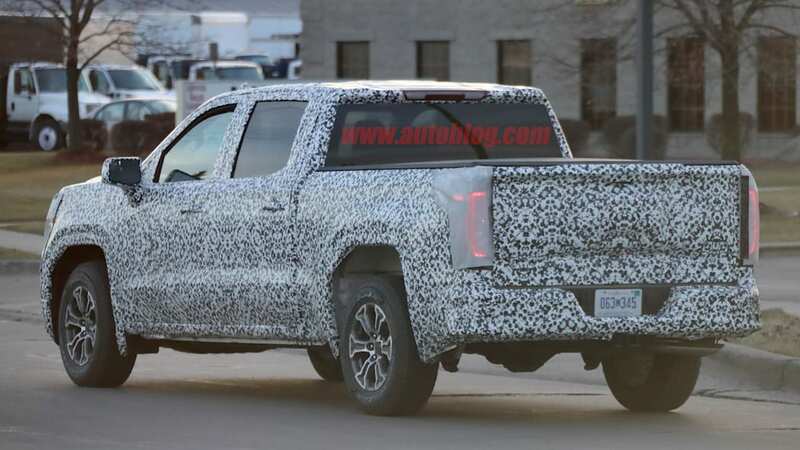 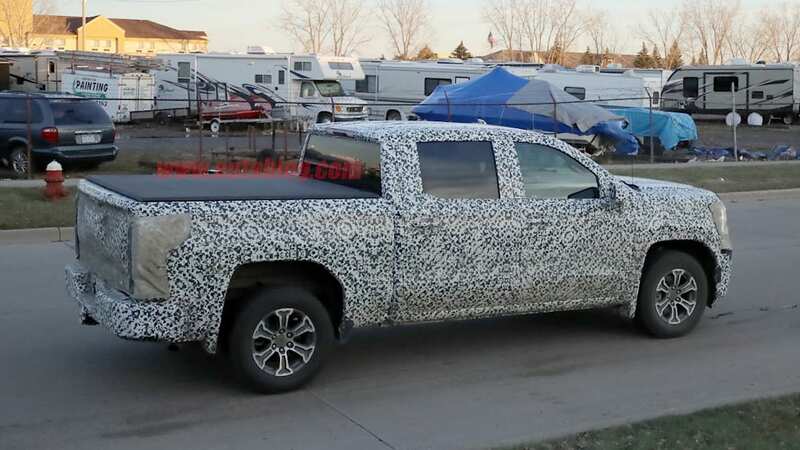 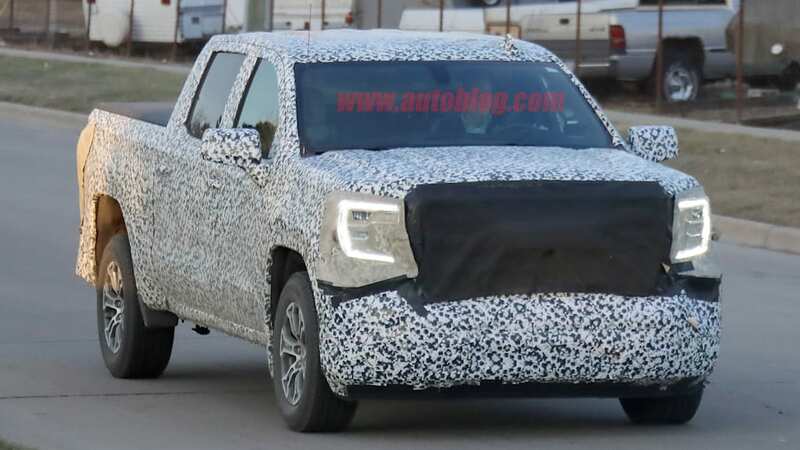 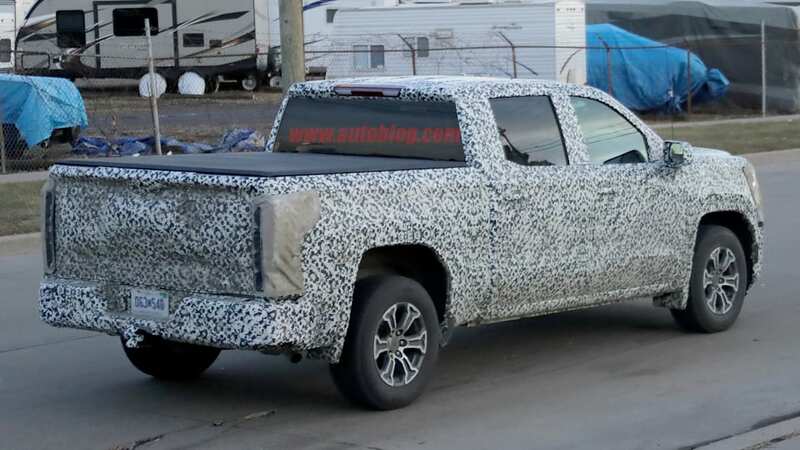 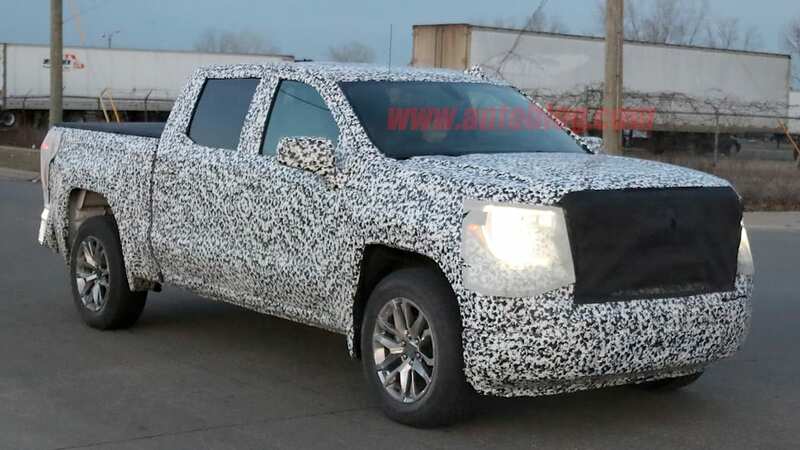 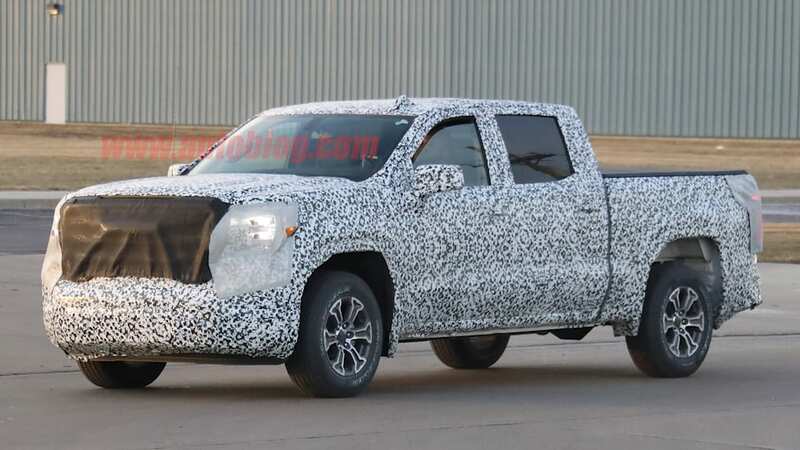 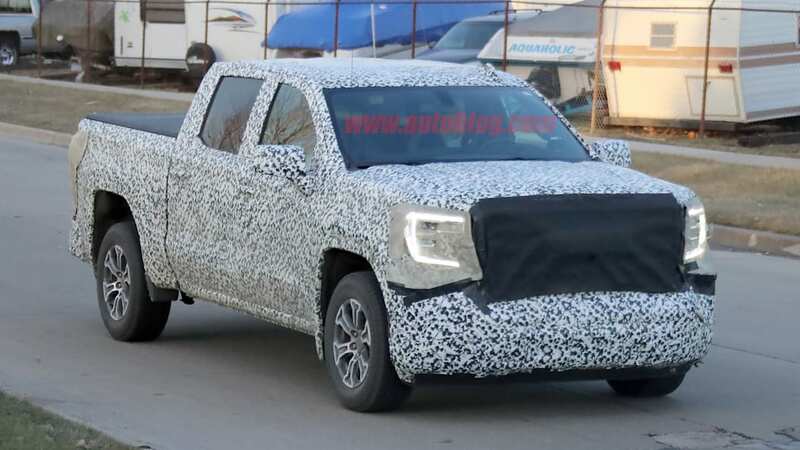 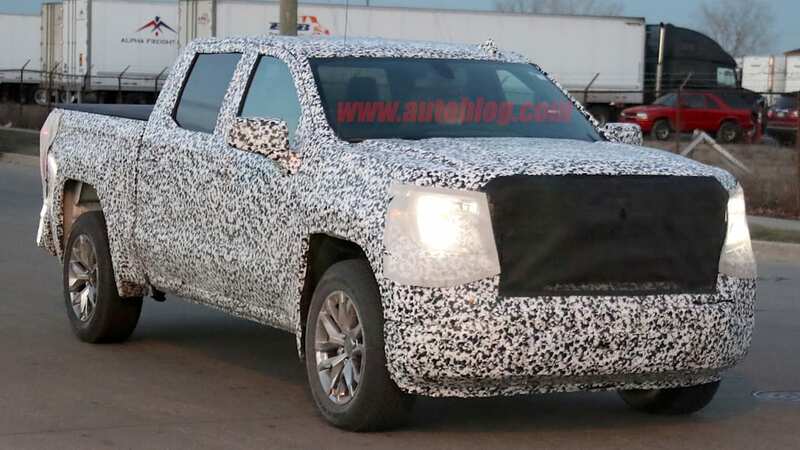 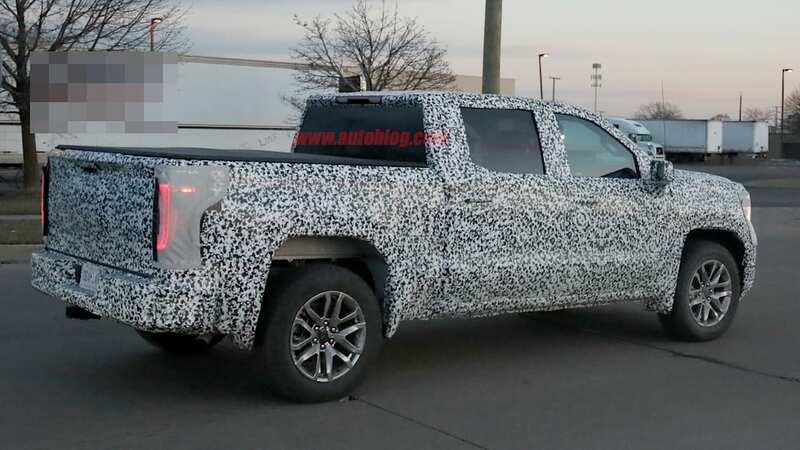 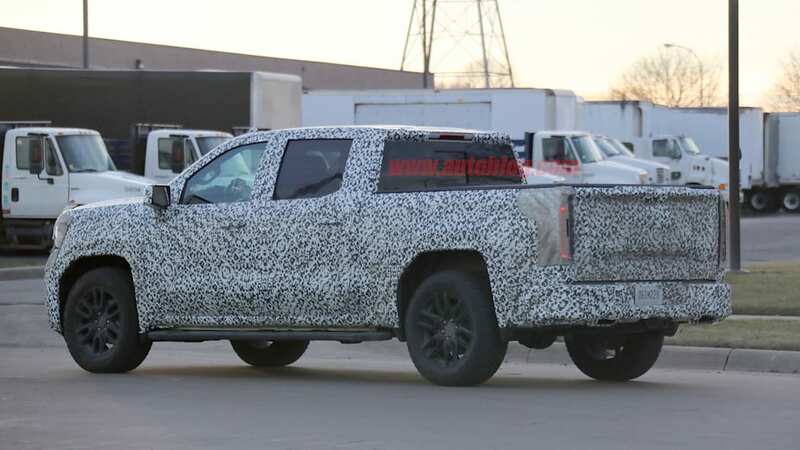 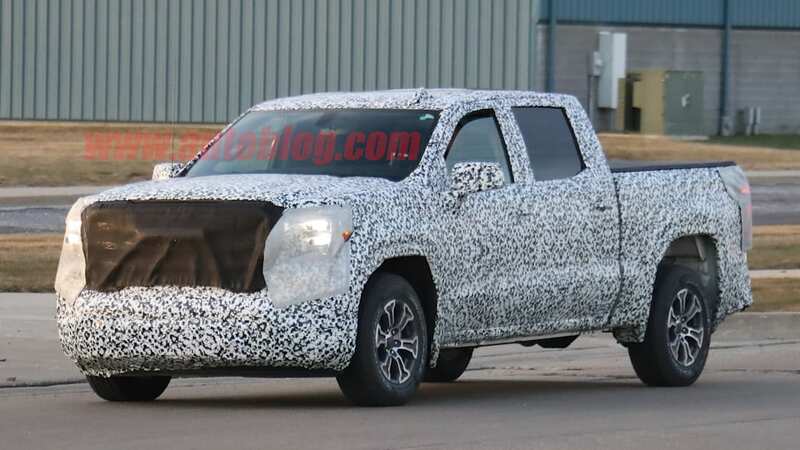 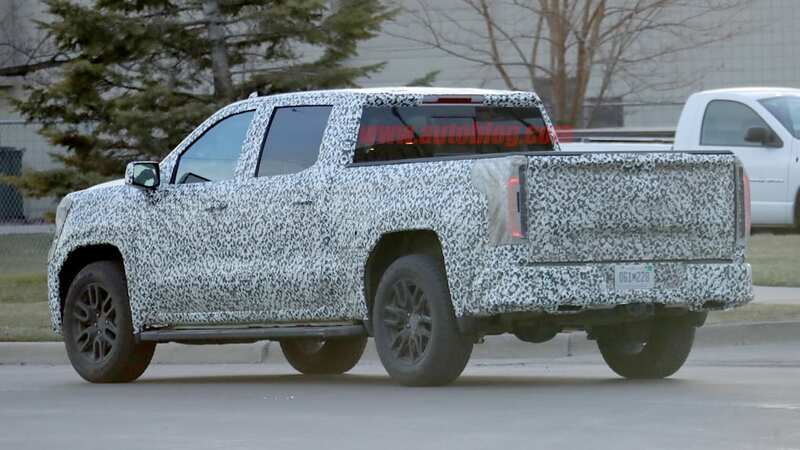 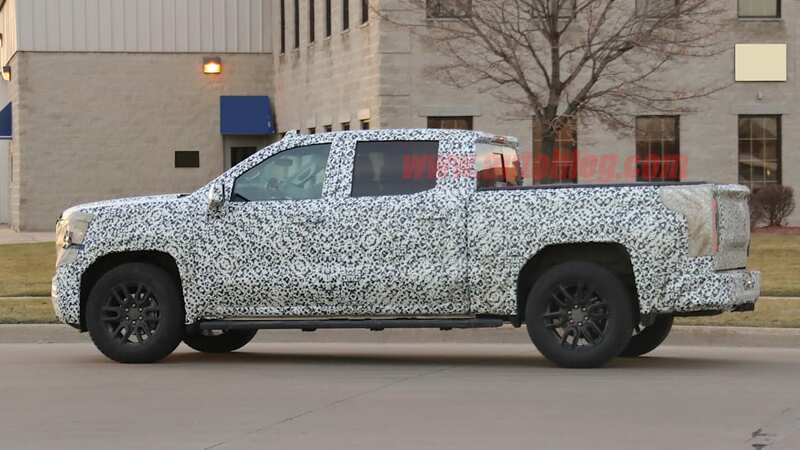 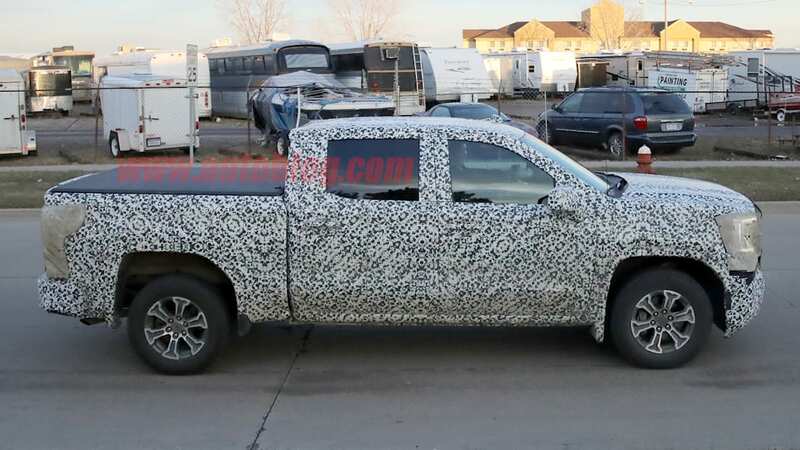 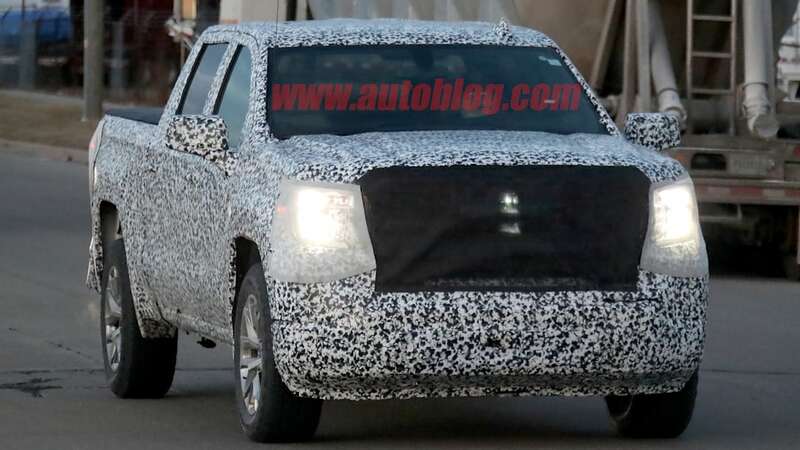 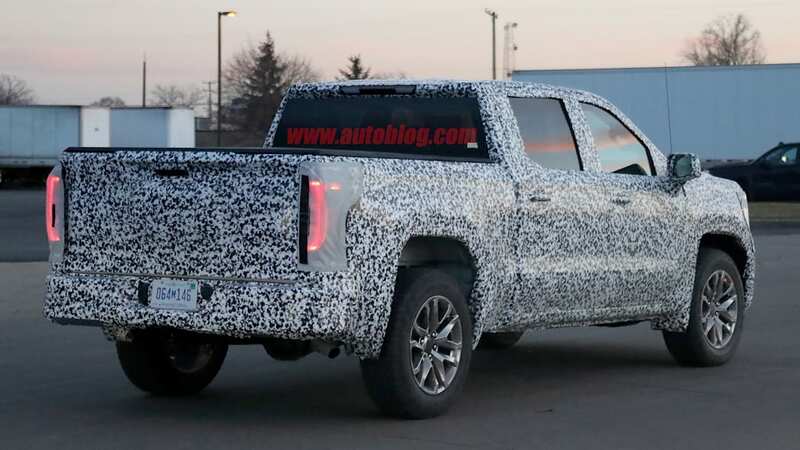 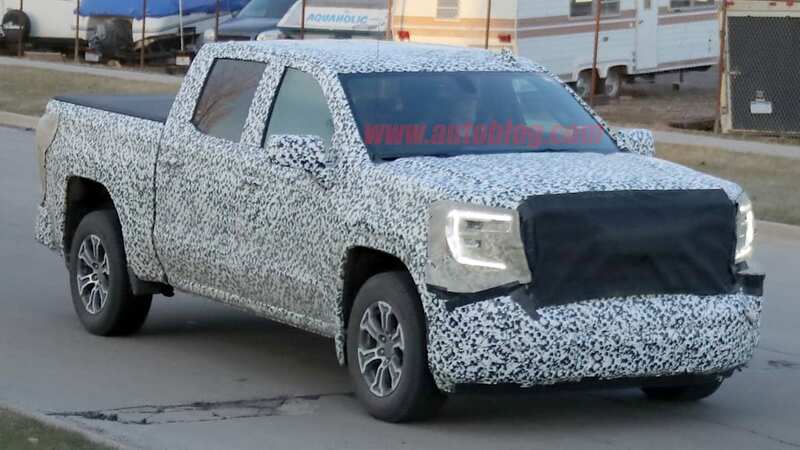 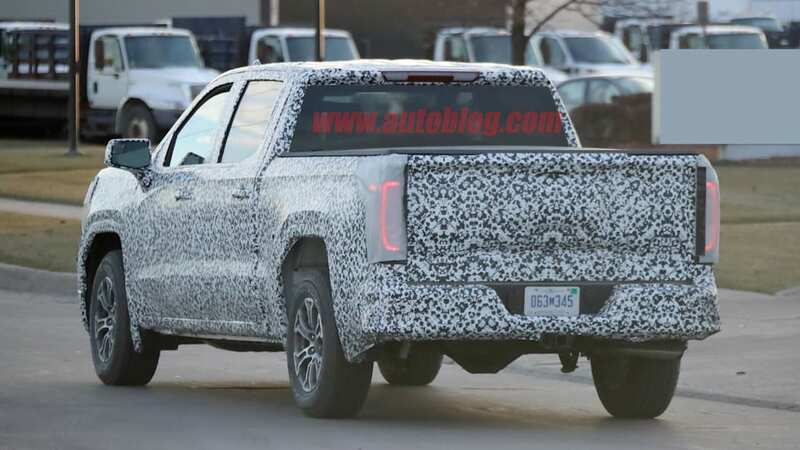 Also, being a GMC, it will likely have a flashy, chrome-laden Denali trim level. 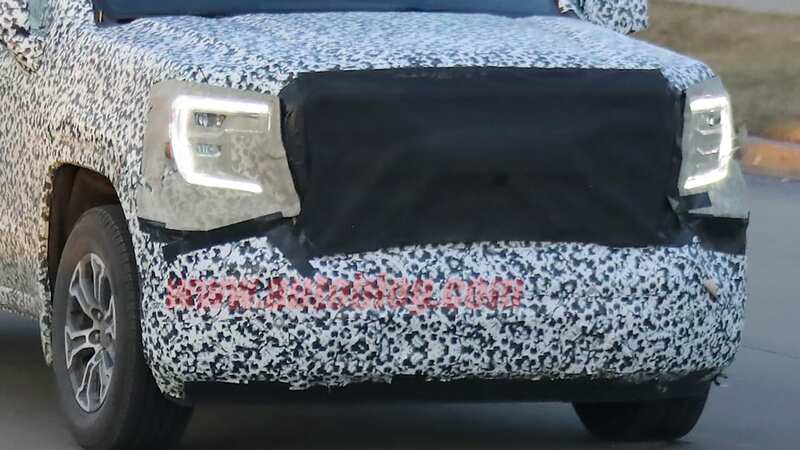 We also will see the fully revealed model soon, as Automotive News reports the debut will be on March 1.